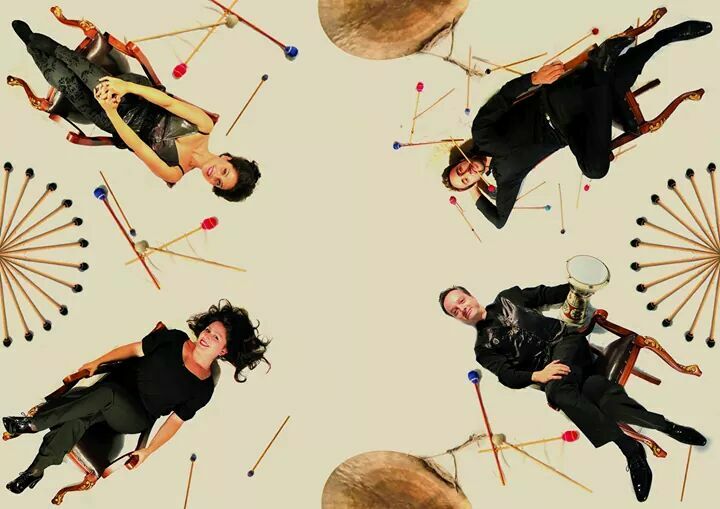 In September 2012, the two pianists Jelena Stojković and Yudum Çetiner and the two percussionists Jürgen Spitschka and Manuel Perez Delgado founded the ensemble Quattro per Due. The name literally means „two for four and four for two“ and, correspondingly, they are all for one: for music. All members originate from different European countries: from Germany, Serbia, Spain, and Turkey. They thus represent the crossover of different genres of music as well as the multicultural awakening of the young generation of musicians. Yudum Çetiner and Jelena Stojković met when they both studied piano at the Munich University of Music and Performing Arts, and often played music together. Through different musical projects, they got in touch with Professor Jürgen Spitschka, and the idea of creating an ensemble in which they could realize their shared vision of music was born, which led to the foundation of Quattro per Due. They found their last missing puzzle piece in Manuel Pérez Delgado, one of Professor Jürgen Spitschka’s former students. The next step was to create a suitable program that incorporated temporal as well as regional variations. This is why their performances feature works by composers from different countries: to demonstrate that music is international and knows no national boundaries. Apart from famous masterpieces, they focus on contemporary compositions. Particularly exciting is that they also perform pieces that they had the opportunity to rehearse with the composer. Some of the pieces were even written especially for this quartet, and were first performed by them. Despite having been established only four years ago, this quartet has already performed numerous times with great success, thanks to the musicians’ level of skill and their extraordinary musical passion. Under the title “No Limits”, which also represents one of their key concepts, the quartet performed in Stuttgart (“Art in the Tower”) as well as in Munich (Carl-Orff-Hall at the Gasteig), supported by the city’s Department of Arts and Culture as well as the Foreigner’s Council. Under the title “East-West Side Story”, the quartet gave a guest performance at the auditorium of the “Center of Art and Music” in Augsburg. Furthermore, they performed at a town hall concert in Vaterstetten as well as at the “Percussion Night” in Stuttgart. They have also already been on a concert tour to Serbia, where they gave one concert in Belgrade and one concert in the synagogue in Novi Sad. Great musical skills, focused interaction and exiting interpretations are the trademarks of this quartet ‒ and the pieces they perform in concert are just as exciting as they are gripping.